First, our plan to do it in a long weekend failed. Our friend who was helping us just ended up having a life and having to cancel. Unfortunately, we had already started and couldn't stop. Second, we found mould. And rotten wood. Sure, good thing we found it. It just kinda delayed things. Third, the scope of the project was not made clear to me at the beginning and new tasks kept popping up that we were ill-prepared to deal with. I had made time in that initial weekend/week. Not two months down the road. I had a life to attend to. This happens with old houses. Fourth, we added "small" projects to the whole because it kind of made sense to them at the same time. Gordon removed some wall in the back room. Around an old chimney. 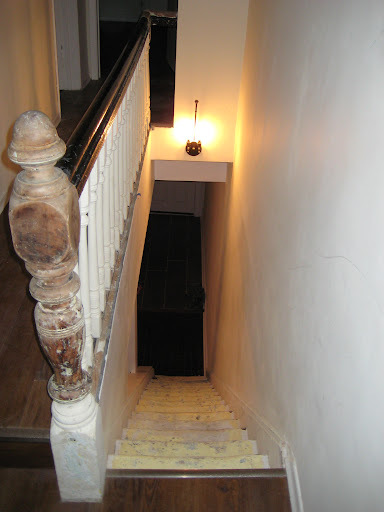 As the hallway sub-floor was rebuilt, the banister spindles had to be removed. So we decided this was the time to finish that project too. Oh, and what about baseboards and door/window trim? Yep, that too. It all makes sense. "Might as well," we say. And the projects pile up. Which means, right now, I'm enjoying my coffee, cozied up to a pile of quarter-round. We dine regularly with pile of flooring sitting in my dining room and this week, we added closet doors to our guest list. My backyard patio set is sequestered next to a hill of soggy refuse. Every morning, a stack of left-over drywall bids me farewell as I maneuver my bike around it. My feet track the drywall dust and shards of chipped-off ages-old banister paint all over my house and furniture. It's rare that I can actually walk in bare feet. Mostly, we must wear shoes to protect ourselves from nails and chemical burns. This is my house. This is where I'm supposed to go after work. It's been two months. There's a light at the end of a tunnel. After sanding, wiping, priming, painting, chipping, stripping, scrubbing and sweeping this weekend -- the floor is supposed to go in Tuesday. Floor means our big bed comes back! Floor means next Friday, our closet doors go on. That maybe we have a real closet again, unpacked clothing. Curtains? Maybe I'll be able to walk around in bare feet! But don't get me wrong. It won't end there. That's just Phase 1. That's just flooring in the master bedroom and hall. After that, we move furniture from another room out so the floor can be completed in there. And then the furniture goes back. And then we clear out the guest room. And then I hire a cleaning lady. Because I'm done. I'd like to have my life back now please.